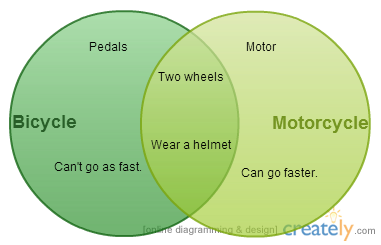 Bicycle or motorcycle – Does your child know the difference? Teachable moment: On the way to camp, D pointed and said, “Bicycle.” However, she was pointing at a motorcycle. Next I suggested that we count how many bicycles and motorcycles we see on the way to camp. This was an easy opportunity to make a math connection and keep her engaged (AKA not bored). She was determined to find some! She was so excited when she saw the next object of our search. It was a bicycle. She shouted, “Look! Bicycle!” and labeled it correctly. When we were almost to our destination, we saw a landscaping truck with lots of equipment on it. She proudly announced, “Motortruck!” We’ll tackle that on a different day. ← Ticked off or teaching opportunity? Both or neither?